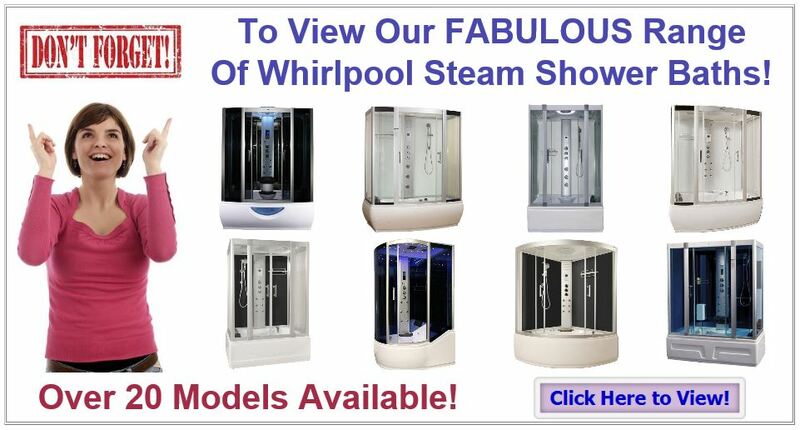 Steam Showers Only Are Displayed On This Page - To View Other Model Types Including Hydro & Whirlpool Showers, Please Click The Quick Access Buttons Below Or The Full Menu Navigation Above. 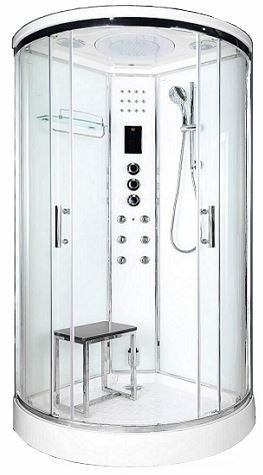 Steam Shower Enclosures: This best buy category section and prices, last updated as from April 2019. 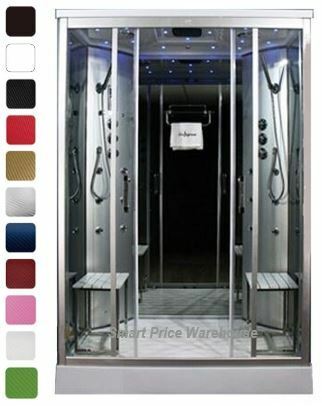 Steam shower options....in this first section below you'll find our smallest steam showers and of course by default, these cubicles are all fully enclosed models with roofs. The most compact size is the 800mm x 800mm, moving up to 900mm x 900mm and all are quadrant tray profiles, for fitting into a corner. The majority are low-step trays but there are several with tub bases, that can be filled with water and ideal for bathing small children. 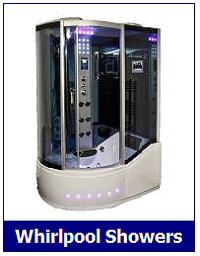 There are cubicle choices in interior finish, from white acrylic & tinted mirror glass, to either white or black glass. 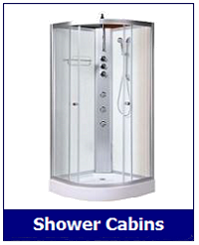 When deciding on a new shower unit and in particular one of our free-standing models, the choice of adding one with a steam function is a definite consideration. Sure, they are a slightly higher price, but the health and relaxation benefits of having a spa-like option in your bathroom, make this a sound choice. 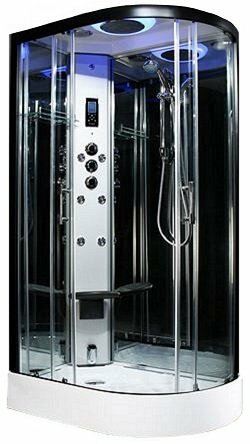 The key showering aspects with steam enclosures are the same as the shower cabins we supply - overhead monsoon shower, hand riser shower & back jets...but now with the added steam function to relax, unwind and enjoy. 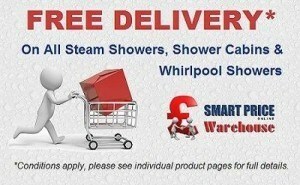 If you're seeking something rather special - perhaps with a bath and whirlpool feature, plus the steam function, check out ​the Whirlpool Bath Showers range. Want to create your very own calming oasis in the bathroom? 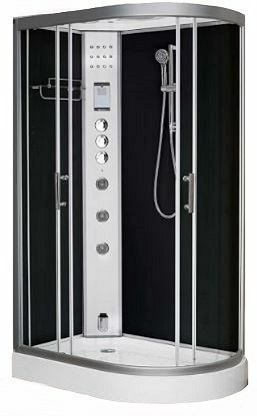 Then consider designing a steam room or steam shower to your specific requirements, with the Insignia Steam Room Kits. 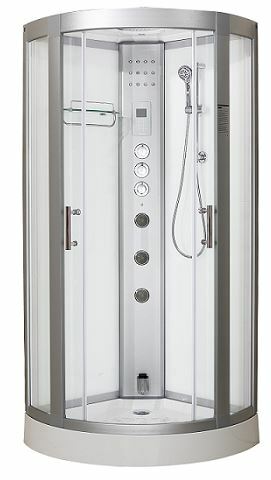 However if you're requirements are less exotic and you are wanting just the key showering features without the steam room effect, then please see the Shower Cabins range of units. 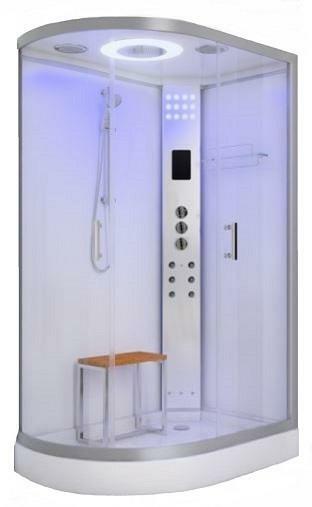 Not seen a free-standing and self-contained shower before? 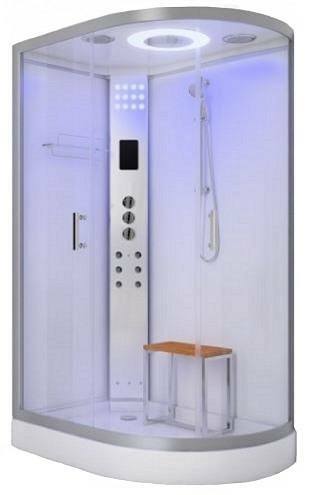 Even though steam showers and shower cabins have been for around many years now, there are course still those who are just discovering this great alternative to the normal shower install with tray, screen and tiles. If you watch the video on the left from Insignia, you're then have a good idea about how this type of unit is assembled and looks. 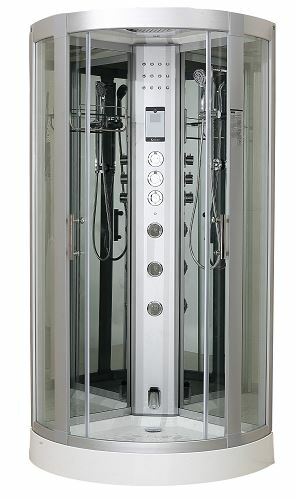 "The perfect steam showers for when fitting space is limited....."
"Larger steam showers for a more comfortable showering experience...."
Below are shown our larger quadrant profile, corner fitting steam showers and sizes range mostly from 950mm x 950mm units up to a 1050mm x 1050mm unit and when available, larger sizes up to 1350mm x 1350mm. 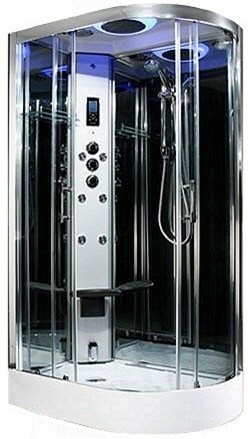 If you're seeking other options in large, corner fitting steam shower model, please see the Whirlpool Shower Bath section. White and black glass, along with tinted mirror glass and white acrylic, are the interior finish choices. 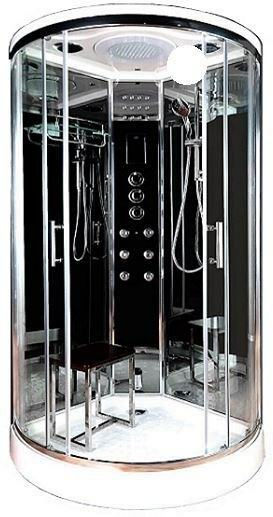 "Offset corner steam showers with extra length and versatility...."
"The off-set steam shower models provide more interior space..."
Accessory items for your shower install including Pump, PEV, Water Softener and Descaler, Glass Cleaner and other items. 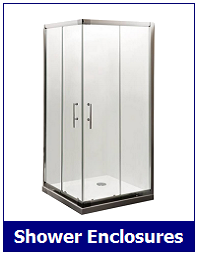 "Maximum use of space with these steam shower enclosure models....."
These rectangular steam showers, are designed to fit against a wall in a position of your choice and all shower tray profiles are low-step. Interior finish on these is either tinted mirror, white or black glass with sliding door entrances at the front. 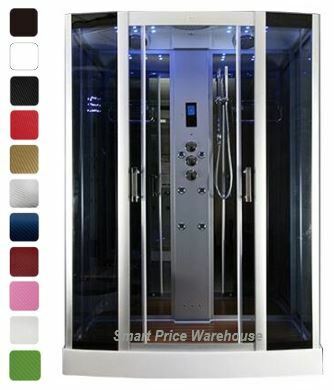 As with all the steam and shower range, the key features with these are overhead monsoon shower and hand riser shower, back jets and the steam function, with additional features to be duly noted. 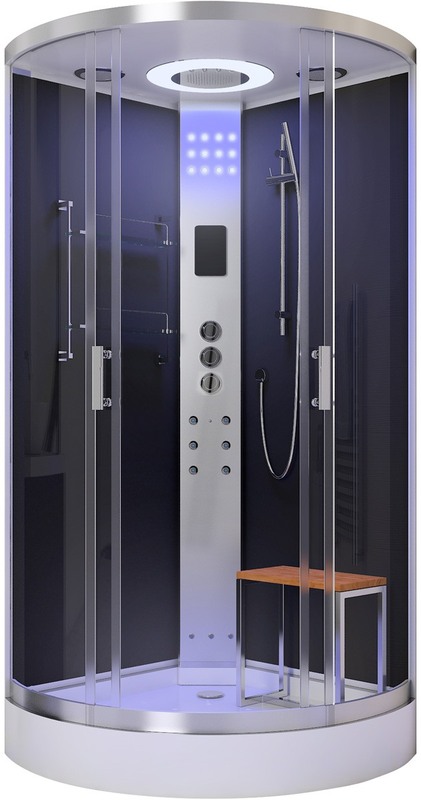 "No tiling or mess with free standing steam shower pods....."
What you have viewed here in this Category page section, is our current full range of steam enclosures and cubicles, with more UK brands to be added, as and when new units become available. 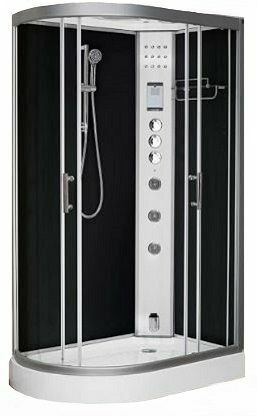 Of course, selecting from this extensive list of showers cabinets, all on the one page, can be quite a task so to help make buying a steam shower easier, as mentioned earlier you can also view by individual steam and shower brands as follows:- Insignia Range - Lisna Waters - Vidalux - Aquaplus﻿ Range and for that added luxury and indulgence, also see our range of combination steam shower whirlpool models. Steam not for you? 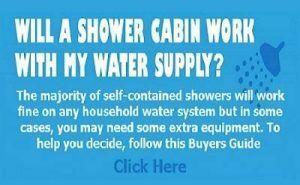 See also our Shower Cabins models. 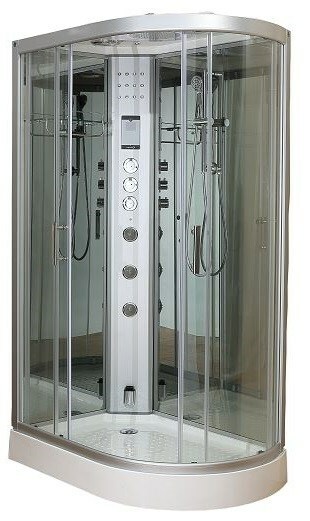 What Size & Shape Shower Units Are There? 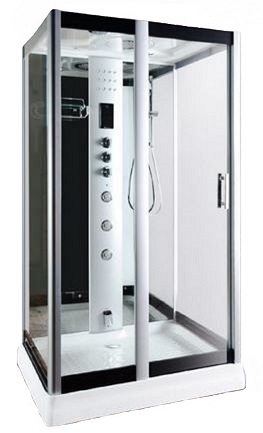 The steam shower cubicles and cabinets are manufactured in a number of different sizes and the more popular ones are listed below. Shapes include corner or quadrant, elongated - also known as offset, rectangular and square. 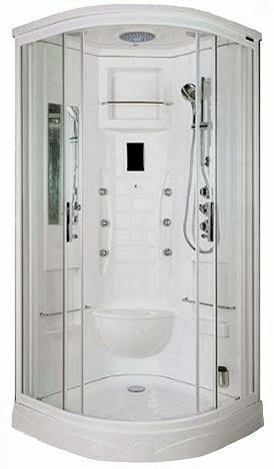 The measurements provided are in mm millimeters and relate to the dimensions of the shower tray and if you draw that size out on the floor as a square or rectangle, the footprint of the shower when assembled, will fit into that space. 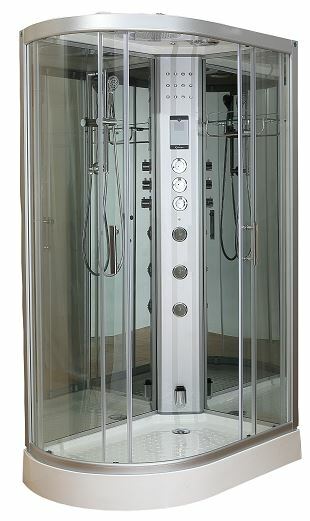 The overall heights of the steam showers can vary and although there are from time to time, models available at circa 2100mm to 2150mm high, the majority range from 2180mm to 2300mm in height. Note: Be sure to check each models schematic as extra space is required for assembly and installation purposes. What Are The Electrical & Plumbing Requirements? 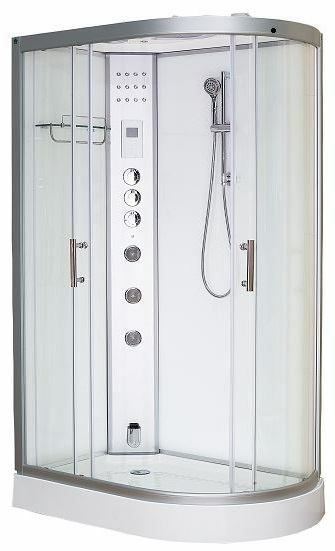 Electrical Requirements: Steam shower models require a 13amp electical connection, either connected directly to a fused spur socket within the bathroom or en-suite or, if an RCD ( Residual Current Device) is available on the mains board, this can be used. Note that most units are supplied with a fitted 13amp plug and RCD for factory testing purposes, but can be removed. 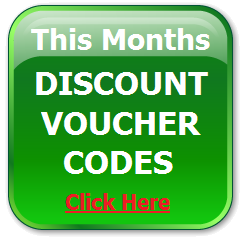 Be aware that all electrical work in the home must be carried out by a Part P qualified electrician. Plumbing Requirements: The water supply required is 1 x hot and 1 x cold feed and this needs to be balanced pressure of between 2 and 3 bar and flow rate of 7.5 litres per minute. Combi boilers and Megaflow systems are fine, although gravity fed systems will require a pump. 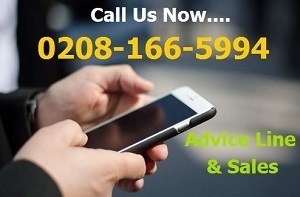 Note: For more information on Electrics and Plumbing, please see the Help Guide section HERE [new window opens]. 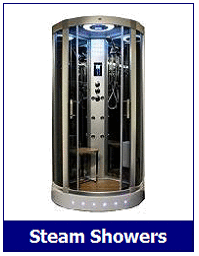 Are There Health Benefits In Using A Steam Shower? Over the course of many years, steam has come to be used by people as an accepted aid for assisting relaxation and various healing processes, also for achieving relief from numerous illnesses and ailments. 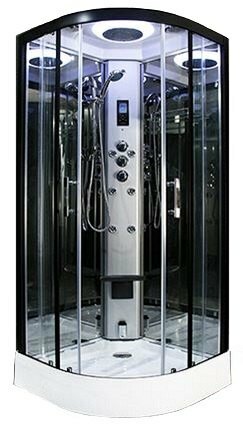 Initially, attending commercial baths & spas became popular, followed by there use in health centers or gyms and more recently, the rise in popularity of installing a steam shower in the home. Years ago, likely in our parents and grandparents era, diets and lifestyles were more benefiting to the body and with greater emphasis on health. They and previous generations, were not so exposed to fertilsers, pesticides and chemicals used in food production or the toxins found in exhaust fumes, metals and manufacturing. Later, rises in pollution levels and usage of chemicals eventually created complications, with severe illnesses & afflictions, a result of concentrated presence of such toxins in the body. These toxin types are made up of the pollutants and chemicals that are present in the environment. These toxin types are made up of biological wastes within the body, which include fat deposits and tissue fluids. 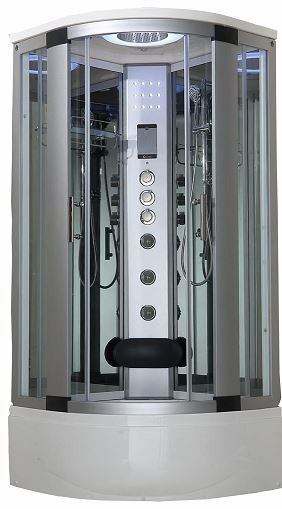 According to reports, perspiring in a steam shower enclosure is more beneficial than perspiring during exercise. During exercise, strain and exertion on the body has affects on the kidney and liver, whilst perspiring in this relaxing way means vital organs are free from unnecessary strain. 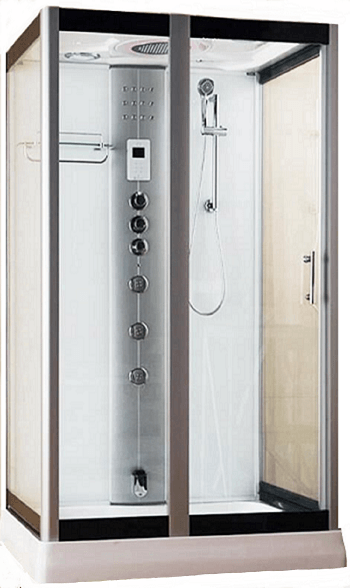 Taking time out in steam filled environment, can provide quality respite to the skin in terms of tone, moisture and clarity. 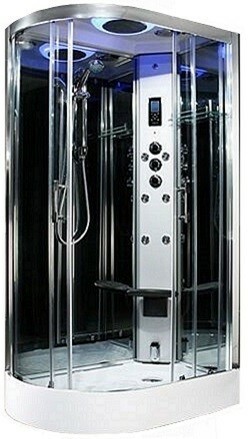 In a steam function shower, the user sets the required temperature and the generated hot water vapour fills the enclosure and the steam assists with opening of the skins pores and thus releasing toxins. In this process, the heat from the steam increases both pulse and metabolism and also stimulates the cardiovascular system, producing an increase in heart beats per minute. With an expansion of the blood vessels too, this improves the flow of blood through the bodies veins and assists the skin in receiving essential nutrients such as minerals, vitamins and oxygen. This process results in an improvement to the skin clarity and tone, often confirmed by an appearance of more radiant and younger skin. From an appearance perspective, steam can also provide benefits in relation to hair care too as women are increasingly using steam for hair styling & treatment, making this humidity and frizz proof, producing faster results than conventional blow drying and iron methods. 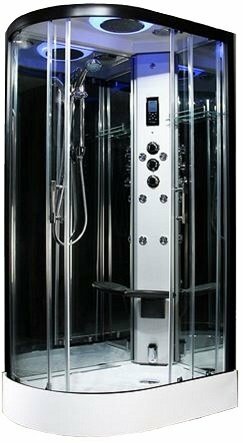 As previously mentioned, the heat and warmth from using a steam shower improves the circulation of blood throughout the body which in turn, helps to relax muscles too. At stressful times or after a long day at work, this process also helps to alleviate tension. As noted by a number of physicians, steam has been known for obtaining relief from arthritis and stiff joints, with research showing that heat therapy can reduce stiffness, pain and fatigue, as experienced by people suffering from ankylosing spondylitis and rheumatoid arthritis. A number of health clubs and spas offer the use of aromatherapy oils with the steam and this can also be used and experienced in a home steam unit. Aromatherapy oils can be helpful with mind relaxation and is also known to aid better quality sleep and even help with insomnia. For people who suffer from ailments like sinusitis, asthma, bronchitis and other allergies of the lung, the use of steam is known to provide relief through reducing congestion and the inflammation in lungs, thus enabling breathing to become easier. Respiratory ailments benefit from the hot and moist air of the steam and is often recommended. Other benefits of steam include a) Endoxins decreased - those toxins present in bacteria b) Interferon activity enhanced - the the protein manufactured by the body for defeating disease caused by microorganisms. 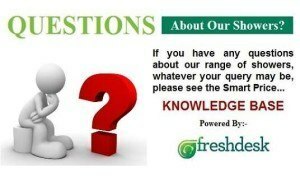 d) Enzymes production increased e) High number of calories burned f) Cleanses the skins pores. 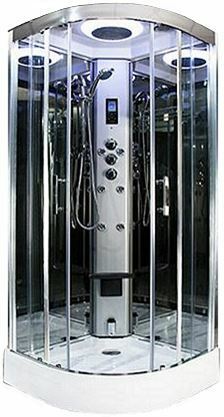 People Who Suffer With Rheumatoid Arthritis and Ankylosing Spondylitis: Research Study Provides Results of Steam Bath Use. It is indicated that in the UK, one in every 1000 people suffer from and are effected by ankylosing spondylitis. This is the disease that causes the spinal bones to fuse together and create inflammation. Causing inflammation in the body joints, rheumatoid arthritis is known as a autoimmune disease and can result in serious damage to body tissues. It is estimated that 1% of the UK population are effected by rheumatoid arthritis and that more women than men, suffer from the disease. In the research and from a state of complete hypothermia, those patients who suffer from ankylosing spondylitis and rheumatoid arthritis enjoyed the experience of heat and steam. It was mentioned that lesser pain was felt, together with enhanced levels of movement experienced. Other results and feedback from patients during the treatment included a) no inflammation was noted b) weight loss of 100gm to 400gm and c) reduced blood pressure. Simply enjoying the benefits of steam, is not sufficient all on it's own for keeping the mind and body healthy and active. 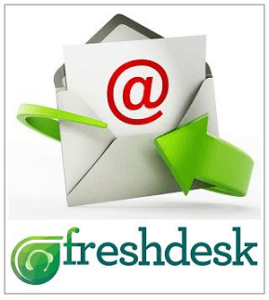 Certainly, the benefits as described above can make a huge difference but the various suggestions below, can help further in developing a far healthier lifestyle. Cultivating positive thinking and being more optimistic. Having a regular exercise regime, daily or weekly. Spending sometime outside in the sunshine daily. Enjoying a good diet, eating healthy food that is fresh.